Steilacoom Historical School District (SHSD) staff members are invited to apply for grants to supplement or enhance educational opportunities for SHSD students. Grants are not being provided for 2018-2019. Please contact SHEF for information. It's scholarship season! 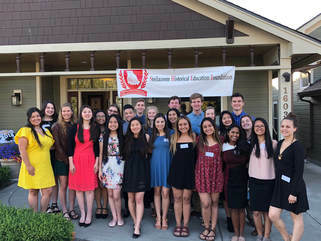 To apply for a SHEF scholarship, graduating Steilacoom High School students must create an online profile on the SHEF Dollars for Scholars website. This profile matches students to local scholarships and national scholarship opportunities. If you are interested in scholarships offered by SHEF, its generous individual donors, the Kiwanis, and We Love Steilacoom organizations; then start your profile now to take full advantage of these resources and possibilities. Local scholarships open January 31st and final applications must be submitted by April 1, 2019. ​Scholarship interviews will be held on a Sunday, May 5, 2019 from 1 to 4 PM. Congratulations to the SHEF Scholarship Winners of 2018!​ Click here to view the 2018 scholarships.